Fall is here, though you wouldn’t know it here in H-town quite yet. But the autumnal equinox is still a noteworthy occasion to mark, and as you likely know I spent the summer really giving myself a break from the review treadmill with positive results. I got to enjoy a lot of older records from various bands that hadn’t been played in ages, and I was able to devote a greater amount of attention to the handful of new music I did listen to. The ones I listened to the most are reviewed below, but there were a host of others that I’m passing on reviewing (new albums by Iron Savior, Dark Funeral, Volbeat, Rage, Nails, Fates Warning, Running Wild, Vicious Rumors, Evergrey to name a few off the top of my head) —- regarding the latter, some of them were pretty good, most kinda meh and nothing that really stood up and grabbed my attention (although Nails is indeed an interesting band). As I sit here waiting for the cool winds to blow in, the leaves to turn color and drop off these damned trees I’m busy making time with the new Insomnium, Darkthrone, and Alcest albums. And I just experienced Blind Guardian’s “Imaginations For North America” tour stop here the other day, meeting yet another one of the bards in the process (Andre Olbrich —- squeeeee!). Its going to be a busy fall metal wise, a lot of late year albums and a handful of concerts coming up! But it’ll be nice for things to be hectic again, I love this time of year. Pumpkin spice me up! It struck me during my first few weeks listening to Sabaton’s latest cannon-shot, the thematically dictated The Last Stand, that the opinions surrounding this album tended to fall into two camps. Either you are a fan of the band and welcomed the album with varying degrees of affection and favor, or you have tended to be a Sabaton critic, and arguably pointed out that the band’s sound had not changed all that much in eight albums. Both opinions are equally valid, but whether or not the latter could be interpreted as a true criticism is something that’s up for debate. Without meaning to come across as snarky, are we really going to criticize a band for playing in their ballpark? Do we do that to death metal and black metal bands? To classic bands like Iron Maiden or Judas Priest? I know I know, a band should be expected to progress within the context of their sound, and I agree and can argue that Sabaton has done that in the past —- that being said, the hardest thing for any band to achieve is to create an identifiable sound all their own, and no one can argue Sabaton hasn’t managed that. The way I hear things, Sabaton made some pretty interesting strides with their last two albums on the musical front, particularly with the increased choral elements on 2012’s Carolus Rex, alongside its symphony draped arrangements. But they also veered off into unexpected territory on 2014’s Heroes, with a spaghetti-western Ennio Morricone motif on “To Hell and Back”, and a throwback period-piece take on the piano ballad for “The Ballad of Bull”. They are capable of expanding or stretching their sound, but they’re wisely sticking to their wheelhouse for the most part because it simply works. And by “works”, I really mean that vocalist/main songwriter Joakim Broden is metal’s most consistent, quality songwriter going on well over an entire decade now. This isn’t an easy feat, but somehow the man has been able to tap into a seemingly endless well of musical inspiration to craft immensely catchy, hook laden songs with a propensity for high drama and adrenaline rushes. For The Last Stand, he either by accident or design leaned towards an old school, or classic if you will Sabaton sound —- that being the keyboard heavy Primo Victoria/Attero Dominatus era. Its an interesting choice that works largely due to how lean and attacking these songs are —- take “Last Dying Breath”, where the keyboard “horn sections” actually work as the song’s musical hook, not allowing the intensity of the verse sections to slow down for a huge, protracted chorus. Kinda reminds me of “Nuclear Attack” from Attero Dominatus. Speaking of expanding musically however, how about a hat tip towards “Blood of Bannockburn”? I’ll confess that I wasn’t wild about the song when it premiered as a lyric video a few months back, but it sounds far better on the album (Nuclear Blast and their crappy quality audio uploads) and it boasts a melody delivered on actual bagpipes, befitting the subject matter of the song. But largely, this is a throwback album for Sabaton musically, and you can hear that shining through on ultra catchy cuts like “Shiroyama”, as ear-wormy and addictive a song you’ll hear all year. I’m a bit mystified as to why Broden doesn’t get more credit for his skill in this particular facet of songwriting —- maybe its that Sabaton shy away from technicality or overt complexity in their songs, but to me the ability of writing memorable melodies is so paramount. Its something a great deal of power metal bands even struggle with. I like the interesting group vocal shouts/grunts in “Sparta”, you guessed it, a song about the famed 300 (think they made a movie about this awhile ago), as they tend to fall into a stomping pattern that actually paints a picture of the Spartans martial movements. Similarly I loved the usage of actual sounds of guns and artillery in “The Lost Battalion”, which conspire to add to the suffocating feeling of being trapped in the Argonne Forest, where its likely all that those soldiers heard for those six days. Give the band credit for being mindful of little details like that, they’re not included just for show, but tend to have a greater purpose. That of course brings up the topic of lyrics, this time bound by the overall thematic link of famous last stands in military history. Again I’ll mention the idea of this album being a throwback, lyrically as well, with subject matter anchored to stories of various historical battles and their gritty details (just like older albums). Its an about face from Heroes, where the focus was on non-violent acts of heroism (a theme that I still laud as admirable in its originality and spirit), as well as from Carolus Rex which was their first actual narrative concept album about the rise and fall of the Swedish Empire. I guess one could view The Last Stand as a “regular” Sabaton album in that respect, and to some it may seem like regression as a result. But I think pairing the decision to go back to a more “regular” thematic approach (for lack of a better adjective) along with revisiting an older mode of the Sabaton musical style is smart, shrewd, and actually gives this album a bit of a looser, free-wheelin’ spirit that sets it apart from the gravitas of its two predecessors. 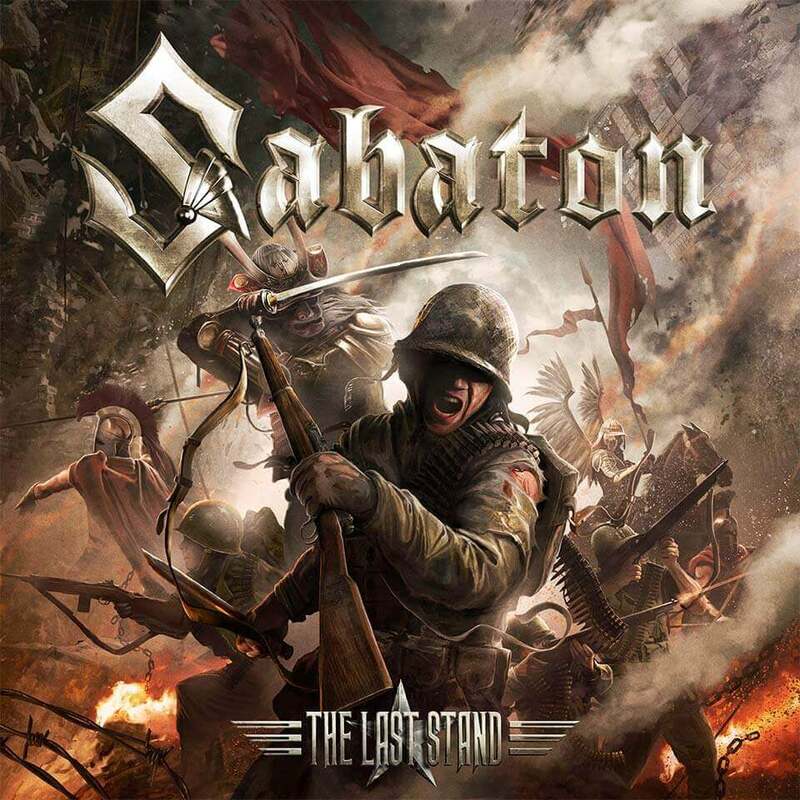 If the last two albums were a more sombre, serious Sabaton approaching complex topics with delicacy and appropriate musical accompaniment, then The Last Stand is more of just a slamming, full-on power metal album with an aim to reset things for both the band and their audience. I’ll be honest, while I can honestly say I think this is a good album with some truly great moments (“Shiroyama”, “The Lost Batallion”, “Last Dying Breath” in particular), it didn’t grab me on the intellectual level that Carolus Rex did, nor the intensely emotional level that Heroes did. That being said, its the right album for the band at their career at this particular point (and I know most people reading this won’t necessarily care about that). It charted in the States at #63, one of the highest positions for a power metal band alongside Dragonforce, Iced Earth, and Nightwish (#17 in the UK! ); they just played at Ozzfest meets Knotfest in what signals to be a breakthrough moment for them with American promoters; and they’re opening for Trivium in North America in a huge score of a support slot this fall. This “reset” album is the perfect introduction for all the new fans they’ll have coming through, and Sabaton have worked hard, they deserve it. That they have vocal detractors online is merely a consequence of their widespread notoriety, and few bands can be all things to all people —- but if you’ve seen the band live you already know why all those criticisms don’t matter, because the impact Sabaton have on audiences from the stage is something no smug internet snark can deteriorate. I’ll find myself coming back to this album again and again, its a worthy addition to their already deep catalog, just not my favorite, but I’m sure its some fifteen year old kid’s album of the year. New Zealand’s own Be’lakor were one of 2012’s biggest surprises for me, their spectacular album Of Breath and Bone smashing into that year’s top ten albums list at number three. I was new to them, and it was a revelation to learn that a band from the southern hemisphere was creating a fresh take on melodic death metal. My enthusiasm for that album has not waned, I’ve consistently gone back to it when the mood strikes, so much so that I felt I was close to wearing it out sometime last year. Thankfully, the band is back after a Blind Guardian esque gap of time between releases with Vessels, an album that simultaneously sounds strikingly different from its predecessor, and comfortingly similar all at once. That paradox is the source of why I’ve had a hard time collecting my thoughts about this album, but I think I might have come to some way of sussing it out (I guess we’ll find out here…). With that said, I’m glad I took a longer time to get around to reviewing this one, mainly because my opinion has evolved a bit from when I first heard it back in July to now. At first I thought it was the cover art that was affecting my interpretation of the sound, that the warmness I getting from the overall tones of Vessels was due to the imagery of lit torches, and that my mind was playing tricks on me. Nope, its not that at all —- this is indeed a warmer toned album compared to the subtle coldness heard on Of Breath and Bone, its melodies a hue brighter with an increased emphasis on major key flourishes. 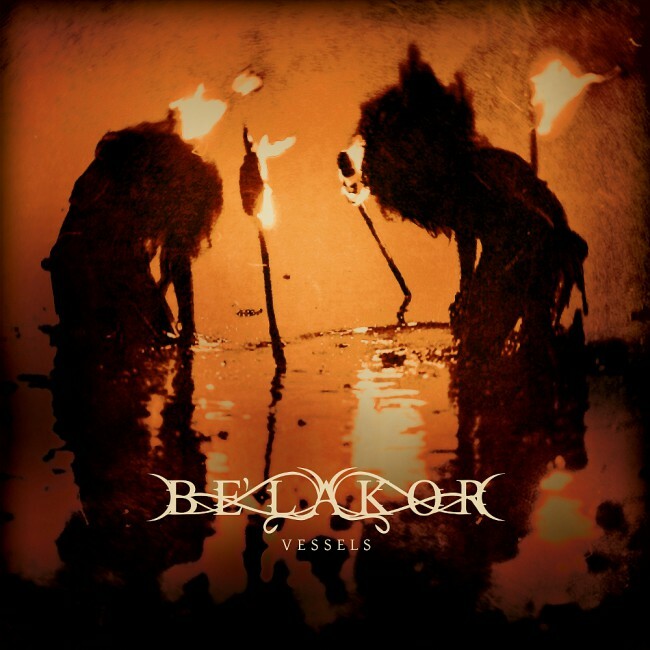 Its still the Be’lakor I came to know and love however, dense melodic death metal that eschews traditional structures of verses and choruses in favor of recurring instrumental hooks and leitmotifs. Alongside the new mode of melodic death metal being forged in Finland by Insomnium, Omnium Gatherum, Ghost Brigade, and to some extent Swallow the Sun, Be’lakor should be recognized as a major force in the revitalization of a once glorious genre. The 1990s source of melodic death metal from Gothenburg was used and abused by American and British bands in the creating of metalcore to such a degree that the original genre was left a dry well. Its this motley collection of artists from such disparate parts of the world that are redefining what melodic death metal could sound like, to spectacular results. How they’re doing this is a far more difficult thing to suss out, but Be’lakor for one doesn’t hide its progressive influences —- time shifts, tempo changes, and free-form song structures abound to such a degree that you can’t help but hear echos of Tool, Opeth, even Dream Theater (really only in structure). On a piece (I feel less comfortable calling these tracks “songs”… if you hear the album you’ll know why) such as “An Ember’s Arc” the band transitions from a cleanly plucked acoustic intro to a tension building staccato riff sequence only to plume outward in the most dreamy, hushed musical sigh you can imagine, isolated notes rising and drifting off into the ether. Its a subversion of expectations, that just when you think they’re going to blow the roof off the place with you in the blast radius, they instead gently push you onto a comfy bed and tuck you under plush blankets where you dream of Emmy Rossum feeding you grapes by an infinity pool. And make no mistake, I’m not suggesting its boring (far from it), merely trying to point out just how skillfully the dynamics of these songs are crafted and performed. The explosion does occur, like the rudest alarm clock of all time, waking you with a gorgeous lead melody rising out of the silence that ushers along a brutal, pummeling blast beat fueled passage. Its almost impossible for me to pick out favorites from this album, simply because my favorite moments are all over the place, scattered hither and yon. If I had to pick though “Roots to Sever” would be a hard one to ignore, its beautiful, ultra-melodic lead guitar melody guiding us through the entirely of the piece over shifting, undulating rhythm section. I noticed that there’s a new drummer in the lineup (one Elliot Sansom), a stunner because I hadn’t notice a drop in creative quality on that front, even though previous sticksman Jimmy Vanden Broek was the unheralded MVP on Of Breath and Bone. Credit the band for understanding how their music is best recorded and mixed as well, because one of the joys of Be’lakor is getting to hear interesting bass guitar in an extreme context, bassist and original member John Richardson crafting basslines that add far more creativity to the music than merely keeping in lockstep with the drums. I started off not sure if I completely enjoyed Vessels as much as the last one, but repeat listens over these past few months have slowly changed my mind, its a compelling, addictive album and a worthy follow up. Though I’ve not written specifically about Woods of Ypres and their brief but monumental career (yet), I’ve been a posthumous admirer of their works and their gone too soon founder David Gold. I unfortunately came to know about the band well after Gold’s death in late 2011, and only through their last album, Woods 5: Grey Skies and Electric Light. It was released a little over a month after his passing, and with Gold as the lyricist, its meditative songs about life, existence, meaning, and death took on an entirely different perspective and gravitas to everyone who heard the album. Five years on and it still has that same power for me and anyone else I’ve talked about the album to… I think I’ve avoided writing about Woods 5 for that reason (though having admitted that out loud, that’s probably the exact reason I should write about it). An important person who contributed greatly to the artistic success of Woods 5 was Gold’s sole bandmate, guitarist Joel Violette, who penned the music for six tracks on the album. He was a newcomer to the Woods of Ypres lineup, the band itself being a rotating cast of assorted musicians too long to recount here, but Violette was different —- something clicked between he and Gold that allowed the latter to share songwriting duties with his newfound partner. Violette’s contributions on the album are spectacular, emotionally affecting moments, his music coaxing out some of Gold’s finest lyrics ever. Sadly, the collaboration was short-lived, and what seemed like a promising joining of talents resulted in only one album —- albeit a masterpiece at that. There was something else that Gold and Violette collaborated on briefly however, and that was Thrawsunblat, Violette’s own project that sought to forge melodic black metal with more of a maritime folk influence. Gold played drums on their demo “Canada 2010”, but that was the extent of his involvement. After Gold’s passing and Woods of Ypres ending as a result, Violette decided to run with the idea of making Thrawsunblat a full time project, and in some small way it was a tribute to Gold who had come up with the band name. Another detail that I view as a tribute was that Violette named Thrawsunblat’s first proper album Thrawsunblat II: Wanderer on the Continent of Saplings, thus retroactively making his and Gold’s initial demo release the first Thrawsunblat album and also in keeping with Woods of Ypres numerical convention for titling albums (a subtle yet touching tribute I think). And that album is worth seeking out, not only for its awesome folk-black metal mix that sounds in some ways like a continuation of the Woods of Ypres sound, but for its completely acoustic slices of maritime folk that are right up my musical alley. 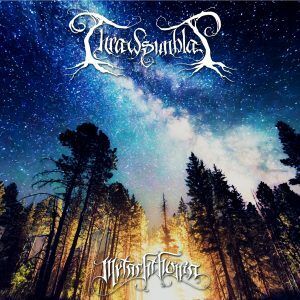 Its sequel, the third Thrawsunblat album Metachthonia, is a slight departure however from the project’s initial musical vision; this time owing more to blistering Norwegian black metal influences such as Borknagar and the darker folk-metal of Moonsorrow. Gone are the concise song lengths of its predecessor, instead Violette and company have constructed longer compositions reaching progressive metal lengths. The tracklisting is pared down to six tracks as a consequence, half of what Wanderer had, but at the album clocking in at two minutes shy of an hour you never feel like this is an EP disguised as a full-length album. I think the major difference that can be pointed to in describing Metachthonia’s different approach is that the folk influences are pushed back from the musical foreground a bit —- on the last album they took up entire songs themselves and were pronounced influences on most songs melodies. Here you’ll get shades of that maritime folk influence in various details, such as the clean vocals of the epic opener “Fires That Light The Earth”, Violette at times sounding eerily like Gold himself. His harsh vocals however remind me of one Andreas Hedlund (aka Vintersorg), lean, razor sharp and just pure burning, white hot fire. On “She Who Names The Stars”, Violette lays down a series of furious tremolo patterned black metal riffs that roll together in gathering intensity, resulting in the most violent sounding song on the album. Its tempting to cite Ulver as a major influence here but what gets in the way of that are the tone and direction of the overlaid lead guitar motifs, owing more to Violette’s self-identified Pacific Northwest folk roots. Said roots peek their head out for a brief star turn towards the end of the track, during its final fifty seconds, where cello and clean electric notes combine in a dare I say, charming melody? There’s a similar moment during the second half of “Dead of Winter”, where an acoustic passage becomes the overriding motif for Violette’s lead guitar patterns thereafter. I love how effortlessly and unapologetically these songs shift from absolute black metal fury to shimmering, folk melody driven sequences. That tendency towards diversity and contrast was a trait I admired about Woods of Ypres and I’m glad to hear that it influenced Violette. His band mates are actually former Woods collaborators Rae Amitay on drums, Brendan Hayter on bass, and session cello player Raphael Weinroth-Browne (who laid down those heartbreaking cello accompaniments on Woods 5), and there’s a sense that this is a project born out of both a void and a calling —- not just to honor the musical spirit of their departed friend, but to continue where he left off. 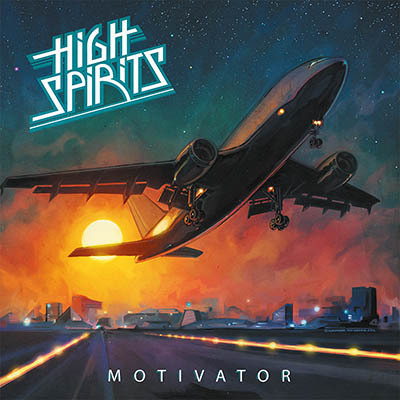 Ah well some of you might remember that I love me some High Spirits, the somewhat retro straight ahead hard rock meets early 80s metal influences project by one Chris Black (Dawnbringer, many others). I was introduced to the project via their 2011 debut Another Night, an album that put Scorpions worship front and center (and that’s alright with me). But the follow-up, 2014’s You Are Here fell a little flat for me, mainly due to lacking much in the way of memorable riffs, melodies, and hooks (barring a few good songs). To be honest I wasn’t even expecting another High Spirits album so soon, figuring Black was working on one of his many other projects, but Motivator sounds like a record that was simply begging to be released, full of the same vitality and energy that coursed throughout their debut. Simply put, these are rocking songs and they’re pretty much all on point, hitting all the classicist nerves that one would want out of a band that is earnest about their love for the sound of the early 80s, where hard rock and metal met in an amorphous blending where subgenres and labeling did not exist yet. And check out that cover art too, the visual cousin to Another Night with its neon framed night time cityscape —- look I know it sounds strange but I’ve long contended that there’s a certain undefinable aspect to the sound of 80s Scorpions songs that always reminded me of an airport at sunset. Lo and behold! Chris Black knows what I’m talking about! The songs, where to start? How about the cover art referencing opener “Flying High”, its Scorpions hat-tips lovingly obvious in that joyous backbeat on the drums, and that very Schenker/Meine trait of guitars outpacing the tempo of the vocal lines. There’s a surprising Maiden influence on “Reach For the Glory”, its opening twin lead melodies sounding like the rock n’ roll cousin to “Aces High”, and frankly they’re just as addictive. The guitars give a little Thin Lizzy treatment on those fragmentary melodies in “This Is the Night”, the same way Gorham and Robertson would punctuate Phil Lynott’s vocals with little five to ten second solos. My favorite has to be “Haunted By Love”, with its Pat Benatar-ish opening riff (cue “Heartbreaker”) and stop/start, sublime chorus that just takes me back to my initial days of exploring so many classic hard rock bands —- a real On Through The Night era Def Leppard feel to that one, particularly in the backing vocals. I know I keep referencing old bands, but its something I can’t help when it comes to High Spirits, because for me that’s half the fun when it comes to this band and their retro-fresh take on a sound that should never die. Black’s relatively monotone vocals are what actually keep High Spirits firmly locked in the present however, because they’re certainly impassioned, but he lacks the vocal range to pull off the acrobatics that we commonly associate with this type of music. But I think that’s a good thing, Black’s inadvertent way of dragging the past up off the booze soaked pavement of the Sunset Strip and stumbling towards the future. I think the most interesting part of the Lost Battalion story is how the commanding officer, Charles White Whittlesey, despite being lauded a war hero and being on the precipice of a promising attorney’s career in a major law firm, could not bring his mind back to balance and died a presumedly suicidal death in 1921. On a similar note, in can be said that the number of casualties by suicide of the Brittish participants of the Falklands War has in recent years eclipsed the number of battle deaths. ‘Back in Control’ indeed. Of course you’ll never hear Broden and co. sing a song about any of these facts… or, for instance, about how the civil war in eastern Ukraine brought an accidental shooting down of a Dutch airliner (200+ dead). Instead you will find countless naive tales of martial glory. Especially in today’s climate of resurging nationalisms across Europe and the world Sabaton’s juvenile schtick is getting increasingly out of place, however technically accomplished their sound may be. Look at metal’s great history of strikingly realistic portrayals of the consequence of violence (like Metallica’s ‘One’). I have to say that a 22 year old, high as a kite Ozzy Osbourne had more common sense and wisdom than the Swedish steroid has and will likely ever have (and he’s over thirty). Hah the Swedish steroid! Well its an interesting point you bring up regarding subject matter, but I wonder how deserving Sabaton is of that criticism. I think back to songs like Cliffs of Gallipoli or Price of a Mile that address the horror/ tragedy of war. To that point, I thought the Heroes album was very inspired, full of songs about non-violent acts of heroism. I think Sabaton come across as more of historical storytellers, I’ve never thought they were peddling nationalism before. That said I find your comment interesting, have never heard that take before. Yeah, I wouldn’t go as far as accuse Sab of consciously endorsing any sort of nationalism but as with most war movies it works on an almost subliminal level – they rarely shy away from showing the horror and gore, but ultimately the whole affair is portrayed as ‘glorious’ in some way, as if shooting a guy before he could shoot you was some sort of achievement for the ages… In the end they’re mostly peddling pretty mainstream historical myths, instead of trying to subvert them in any way. One of the most egregious examples is the track 40:1 about the Battle of Wizna during Germany’s invasion of Poland. First of all the titular disproportion of strength between opposing forces comes from comparing the nominal numbers of the Wehrmacht units (including rear personnel who were in reality nowhere near the fight) with the estimated actual numbers of Polish defenders present. This has been debunked many times since the war. Secondly, they never mention how directly afterwards the Polish army held the biggest field court martial of the campaign, in order to adress the large scale of desertion. The Polish soldiers ran away en masse from the obsolete and indefensible fortification line they were told to hold. Better live to fight another day than burn alive! In the end it didn’t matter, as the Nazi forces overrun the whole area and the courtmarshall itself had to turn tail before they managed to convict anyone. If find that would make a much interesting story for the lyrics than the usual faff we got. If only Mr Mohawk would find the time between sets of squats to do some deeper reading on his favourite subject matter! Hadn’t heard that part of the story before, but in fairness to Sabaton, I hadn’t heard of The Battle of Wizna before hearing 40:1. I guess it could be seen as lyrical license, that the song itself is an ode to the concept of Polish resistance in general, which does have deep roots in that society if I’ve learned anything from the scant reading I’ve done. That in itself is blurred by nationalistic vision, but its coming from a Swedish lyricist, not a Polish native. Are Sabaton writing these songs purely to win over specific European audiences/demographics? I can’t really see that —- from the interviews I’ve read their interest in history really blossomed around the time they were on the verge of writing the Primo Victoria album, and that everything since then has been a result of a growing interest on their part. I think they’re just metalheads who realized they found a lyrical angle that differentiated them, that they could run with and do well at and are reading/learning all this stuff as they go on. But I’m definitely biased in giving them the benefit of the doubt, being a fan and having met the band more than a handful of times. I take it you’re not a fan of Mr. Mohawk? Joakim might not be the most versatile of metal singers, let’s leave it at that 🙂 I honestly think him and the rest of the guys are legitimate metal and military history buffs and are actually less pandering than the acrimonious offshoot band Civil War, who’s been milking American Civil War imagery for three albums now, outdoing even Jon Schaffer. And it’s mostly coincidential that Sabaton’s music is sometimes coopted by some awful individuals (see commenters on their vids on youtube.com). But they certainly should be aware of this and it’s a little dismaying they don’t show any real growth in terms of lyrical themes literally for the last 9 years since Primo Victoria. Eh, I’d argue Carolus Rex and to greater extent Heroes demonstrated that growth. That The Last Stand sees that lyrical bent going backwards is a bit of a consequence of their decision to make this a throwback album overall. And I’m not sure its on them to change as a result of any oddballs they get, no more so than Slayer would be for say “Angel of Death”. I don’t see what they could do to change lyrically at this point.